"JWU" redirects here. For the Japanese university, see Japan Women's University. 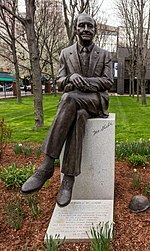 Johnson & Wales University (JWU) is a private career-oriented university with its main campus in Providence, Rhode Island. Founded as a business school in 1914 by Gertrude I. Johnson and Mary T. Wales, JWU currently has 12,930 students enrolled in business, arts & sciences, culinary arts, education, engineering, equine management, hospitality, and engineering technology programs across its campuses. The university is accredited by the New England Association of Schools & Colleges (NEASC), through its Commission on Institutions of Higher Education. Johnson & Wales Business School was founded in September 1914 in Providence, Rhode Island. 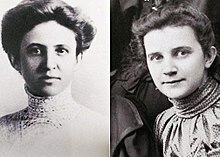 Founders Gertrude I. Johnson and Mary T. Wales met as students at Pennsylvania State Normal School in Millersville, Pennsylvania. Years later, both were teaching at Bryant and Stratton business school in Providence (now Bryant University) when they decided to team up and open a business school. The school opened with one student and one typewriter on Hope Street in Providence. The school soon moved to a larger site on Olney Street, and later moved downtown to 36 Exchange Street to better serve returning soldiers after World War I. The curriculum in the early part of the 20th Century included bookkeeping, typing, shorthand, English, and Mathematics. The school admitted both men and women. In June 1947, founders Johnson and Wales, facing old age and illness, sold Johnson & Wales Business School to partners (and Navy buddies) Edward Triangelo and Morris Gaebe. At this time the school had roughly 100 students. Triangelo and Gaebe served as co-directors as the school grew rapidly. The school earned national accreditation in 1954. In 1960, Johnson & Wales was accredited as a junior college. The school became a registered nonprofit organization in 1963. Edward P. Triangolo served as the college's first president from 1963 to 1969. Morris Gaebe served as president from 1969-1989, and later Chancellor. Gaebe introduced the hospitality program in 1972, despite skepticism from the college's board. Enrollment in the program grew from 141 students in 1973 to 3,000 in 1983. Eventually the school's culinary programs became widely renowned. The college officially became Johnson & Wales University in 1988, known informally as JWU. By 2016, the university had 16,000 students and more than 2400 employees across campuses in four cities. Degree programs were offered in business, culinary arts, arts and sciences, nutrition, education, hospitality, physician assistant studies, engineering, and design. Two previous campuses in Charleston, South Carolina (opened in 1984) and Norfolk, Virginia (opened in 1986), were gradually consolidated into the Charlotte campus, starting in September 2003 and ending in May 2006 with the closures of the Norfolk and Charleston campuses. JWU currently has four academic units at four of its different campuses: the College of Business, the College of Culinary Arts, the Hospitality College, and the College of Arts & Sciences. 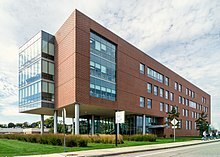 The Providence Downcity campus is home to the College of Business, the Hospitality College, the College of Arts & Sciences, and the School of Technology. This campus is home to several additional academic units: the Alan Shawn Feinstein Graduate School and the College of Culinary Arts. It also has the School of Education, which offers specialized master's and doctoral degree programs. Students just entering the field can earn a Master of Arts in Teaching (M.A.T. Program), and current teachers can earn a Masters of Education degree (M.Ed.). For current teachers who want to advance their degree, there is a doctoral program where they can earn their Ed.D. Johnson & Wales University also offers 11 online bachelor's degrees and nine online master's degree programs. Johnson & Wales University is well known for its culinary arts program, but was first founded as business and hospitality programs. The university is the largest food service educator in the world. JWU is one of the top three hospitality colleges, according to the 2010 rankings released by the American Universities Admissions Program, which ranks American universities according to their international reputation. JWU is home to the 39th largest college of business in the United States. The university offers a wide variety of degrees, including Accounting, Fashion Merchandising & Retail Management, Equine Studies/Equine Business Management & Riding, Management, Marketing, Criminal Justice, Entrepreneurship, Hotel & Lodging Management, and Sports/Entertainment/Event Management. The Providence Downcity campus offers two- and four-year degree programs in areas of technology such as network engineering, electronics & robotics engineering, computer programming, biology, health science, and graphic design. JWU's academic year is divided into three trimesters, each 11 weeks long, where the standard fall and spring semesters are replaced with fall, winter, and spring trimesters. With the start of the 2018-2019 academic year, JWU is offering all graduate degree programs, except for the master’s level education programs, on a semester calendar. The conversion to semesters will be completed in fall of 2020 for all undergraduate, continuing education and master’s level education programs offered at the university. Classes are also offered during the summer months, creating a fourth academic period. This results in an earlier spring break and a typical summer break from May to September. During fall, winter, and spring terms, students usually take three to four courses a term. Students in the culinary program are enrolled in five nine-day lab sessions, which take place Monday through Thursday each week. Such courses are only available for full-time students. In addition to the on-campus academic buildings and dorms, the university also operates hotels used as practicum education facilities for the university's Hotel & Lodging Management, Food Service Management, and Culinary Arts degree programs. The university also owns the Doubletree Hotel Charlotte-Gateway Village at the Charlotte Campus. The Wildcat Center is the athletic facility of Johnson & Wales University. Denver was the only campus to officially have that name, until the Providence campus renamed its gym as well (formerly the Harborside Recreation Center) and the construction of the Charlotte campus athletic facility. It is home to the athletic program of this branch of the university, and was home to the ABA's Colorado Storm in 2004. In Denver, Wildcat Center is located at the northwest part of the Johnson & Wales campus. The Wildcat Centers, fully renovated as of the summer of 2009, are NAIA and NCAA regulation size, and seat over 600. In Denver the fitness center has tripled in size, and the locker rooms have increased from two to four,to accommodate game day needs as well as general use. The Providence Wildcat Center is located on the Harborside Campus, and has many similar features. The fitness center is already large enough, at twice the size of the downtown center. 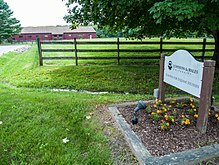 The Charlotte Wildcat Center is located adjacent to the Cedar Hall South dorm building. The center covers 33,000 square feet and is the newest Wildcat Center to be built. Providence now features the Scotts Miracle-Gro Athletic Complex, located on the Harborside campus, which hosts baseball, softball, soccer, lacrosse and field hockey. The Providence Downcity and Harborside campuses currently offer membership in 15 fraternities and sororities as well as two social fellowships. These are organized within four groups who act as the governing bodies: the InterFraternity Council (IFC), the Panhellenic Council (PHC), the United Cultural Council (UCC), and the National Pan-Hellenic Council (NPHC). While all of these organizations are nationally or internationally affiliated, the university oversees the Greek community on campus. Not recognized by the university, the Providence campuses are also home to a number of "off-campus" fraternities. Deeply rooted in tradition, some of these organizations make up the origins of Greek life at the university and continue to exist and recruit new members without the sanction of the school. The teams of all campuses of Johnson & Wales University are known as the Wildcats. Willie T. Wildcat (better known as Wildcat Willie) is the official costumed mascot. The suit was redesigned and revealed at the annual family weekend on October 16, 2013 as an early start to the school's centennial year (2014). Previously the costumes had been very different across the four campuses, but the new design replaced all former costumes. The new design came from Devon Tsinzo (Providence Class of 2015), who won the redesign contest. The new mascot was made by BAM! Mascots. Willie appears at home games, alumni events, and other special events. He is played by multiple students, meaning that JWU can accept requests for him to appear at many events. Although the various campuses compete either in the NAIA, USCAA, or NCAA Division III, Willie follows the rules of a Division I mascot, including never breaking character. During the 1980s and 1990s the official mascot at the JWU Providence campus was Griff the Griffin, a creature with the head of an eagle, body of a lion and tail of a dragon. JWU Providence (Downcity and Harborside) teams participate as members of the National Collegiate Athletic Association's Division III. The Wildcats are a member of the Great Northeast Athletic Conference (GNAC). Men's sports include baseball, basketball, cross country, equestrian, golf, ice hockey, lacrosse, sailing, soccer, tennis, volleyball and wrestling, while women's sports include basketball, cross country, equestrian, lacrosse, soccer, softball, field hockey, tennis, ice hockey and volleyball. The Wildcat men's ice hockey team competes as an associate member of the New England Hockey Conference. JWU North Miami teams participate as a member of the National Association of Intercollegiate Athletics (NAIA). The Wildcats are a member of The Sun Conference. Men's sports include basketball, cross country, golf, soccer and track & field, while women's sports include basketball, cross country, golf, soccer, and track & field. JWU Charlotte teams participate as a member of the United States Collegiate Athletic Association (USCAA) as an independent. Men's sports include basketball and soccer, while women's sports include basketball, volleyball, and soccer. JWU Charlotte Lady Wildcats Basketball team are 2018 UCSAA Div II National Champions. JWU Denver teams participate as a member of the National Association of Intercollegiate Athletics (NAIA). The Wildcats are a member of the Association of Independent Institutions (AII). Men's sports include basketball, cross country, soccer, track (indoor/outdoor), and lacrosse, while women's sports include basketball, cross country, soccer, lacrosse, track (indoor/outdoor) and volleyball. Women's lacrosse is an affiliate member of the Kansas Collegiate Athletic Conference. JWU Denver announced on February 21, 2017 that it would transition from the NAIA to NCAA Division III, a multi-year journey commencing with an "exploratory year" in Fall, 2017. The school plans to compete as a member of the Southern Collegiate Athletic Conference beginning with 2018-19 season, where it will pair up as a travel partner with the SCAC's Colorado College. Johnson & Wales University is planning future expansions to be complete in 2017. This includes a plan dealing with new facilities in Providence and Miami, reducing student debt, hiring more faculty, among other things. ^ As of June 30, 2015. "U.S. and Canadian Institutions Listed by Fiscal Year (FY) 2015 Endowment Market Value and Change in Endowment Market Value from FY 2014 to FY 2015" (PDF). National Association of College and University Business Officers and Commonfund Institute. 2016. Archived from the original (PDF) on 2016-01-31. Retrieved 2016-03-18. ^ "Johnson & Wales University, Providence Campus Fact Sheet" (PDF). JWU. 2016-03-01. Retrieved 2016-03-18. ^ "JWU - Private, nonprofit, accredited educational leader - Johnson & Wales University" (PDF). www.jwu.edu. ^ "About J&W". jwu.edu. Archived from the original on 2000-11-09. ^ a b c d e f g h Frank L. Grzyb and Russell DeSimone (2014). Remarkable Women of Rhode Island. History Press. ^ a b c d e f g h "Honoring Chancellor Emeritus Morris Gaebe (1920-2016)". JWU News. Providence, RI: Johnson & Wales University. 12 October 2016. Retrieved 1 January 2018. ^ a b c Miller, G. Wayne (14 October 2016). "Man who oversaw growth of J&W called 'visionary'". The Providence Journal. Retrieved 1 January 2018. ^ "College of Business". Johnson & Wales University. ^ "College of Culinary Arts". Johnson & Wales University. ^ "The Hospitality College". Johnson & Wales University. Archived from the original on 2002-12-21. ^ "School of Arts & Sciences". Johnson & Wales University. ^ "Academic Services". Johnson & Wales University. ^ "School of Education". Johnson &Wales University. ^ "Us Universities Rankings". Auap.com. Retrieved 2016-03-18. ^ "Conversion to Semesters | Johnson & Wales University". www.jwu.edu. Retrieved 2019-04-01. ^ "Denver - Johnson & Wales University". www.jwu.edu. ^ "New Wildcat Willie Revealed" (Press release). JWU. 2014. Retrieved 2016-03-18. ^ "Johnson & Wales (Denver) Becomes Ninth SCAC Member". Southern Collegiate Athletic Association. Retrieved 21 February 2017. ^ "Johnson & Wales College of Culinary Arts Inducted". www.culinaryhalloffame.com. ^ "The Centennial Plan: Making JWU Better for You". Johnson and Wales University. Retrieved 16 November 2014. ^ "Seafood Choices Alliance - Michelle Bernstein". seafoodchoices.com. Archived from the original on 2007-07-11. Retrieved 2007-07-02. ^ "5 Questions: Chris Hastings". Andrew Zimmern. ^ Alcorn, Stacey (30 April 2016). "How to Be the Change - An Interview with Dr. Thomas McGovern". Huffington Post. Retrieved 23 March 2019. ^ "Charles Rosa - Official UFC® Fighter Profile". www.ufc.com. Wikimedia Commons has media related to Johnson & Wales University campuses.